37 degrees, 15 PAX including an FNG and a visitor from out of town, could the day get any better! “The Chain Gang” is a partner AMRAP, in Pairs of two’s partner start and finish together. 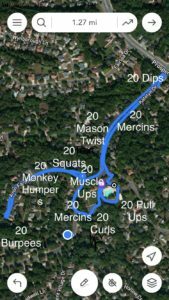 It is a 1.27 Mile loop with 10 pain stations. Start Finish line is located at the Precinct’s Intake section of the compound. And goes something like this…. Return the Start/Finish line and get as much as you can. This is an AMRAP event so keep track of your progress. A google Doc will be posted to keep track of your progress this year. Score yourself by counting the number of completed LAP’s and the completed stations during a partial lap. As an Example if you complete a full lap and progressed though the stations to fully complete Stations #5, your score is 1.5, or is If you completed 2 Laps and progressed though the stations to fully complete Stations #2, your score is 2.2. Prayer Brutus and Landlord for the Mission they depart on this Thursday. And full recovery for travel partner from the FLU. John Reily’s full recovery from Cancer, 1 more chemo and re screen in two weeks. He can feel the prayers and feel the heeling, God is at Work here – keep your faith Strong for John. Great Turn Out, made it a lot of Fun!